WOKING Hospice is one of four charities to receive a share of money made by the re-use shops at Surrey’s amenity tips. The organisations, which each received £440, are the first to be nominated by customers of the shops to share in the proceeds from selling second-hand furniture and household items. 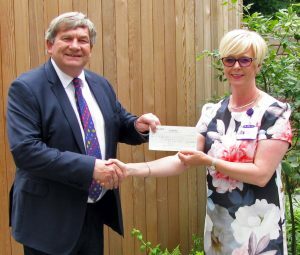 Cheques also went to The Children’s Trust at Tadworth, the Wildlife Aid Foundation at Leatherhead and Age UK Surrey. A hospice spokesperson said: “We are delighted that the public have kindly taken the time to vote for the Woking & Sam Beare Hospices as their Revive charity for this quarter.